- Compatible with Canon EF cameras. 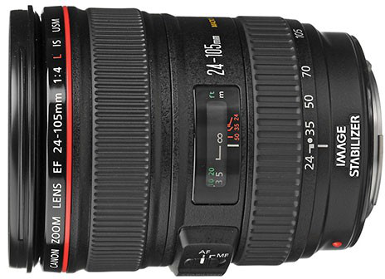 - Focal length of 24-105mm and maximum aperture of 4.0mm. - 1 super UD glass element and 3 aspherical lenses minimize chromatic aberration and distortion. - Ring-type USM system delivers silent but quick autofocus (AF); full-time manual focus. - 0.23x magnification. - Image Stabilizer technology steadies camera shake at up to 3 stops.